AKILAH SANDERS-REED ’16 was only 15 when she began organizing events to raise awareness of climate change. She was 17—still too young to vote—when she filed suit against the governor and State of New Mexico to reduce carbon dioxide emissions and protect the atmosphere over the state. Ever since hearing a speech by environmentalist and author Bill McKibben, Sanders-Reed has been an activist— organizing events, speaking to student groups, and leading service projects like cleaning up the banks of the Rio Grande. That river runs through Albuquerque, near her mountain hometown of Sandia Park, N.M. Her lawsuit is based on the public trust doctrine, the principle that government is obligated to preserve certain resources for the public good. It was filed in May 2011 by Sanders-Reed “by and through her parents” along with WildEarth Guardians, a conservation organization focused on the American West. The defendants filed a motion to dismiss, but last summer Judge Sarah Singleton denied their motion. She also allowed the plaintiffs to submit interrogatories, including questions for the State about the amount of greenhouse gas emissions produced and how factors like drought, wildfires, and the economy were considered when the state repealed its greenhouse gas emissions regulations in 2012. Sanders-Reed’s lawsuit is part of a larger climate litigation strategy through which youth plaintiffs have brought legal actions in nine other states and at the federal level. “I’ve always had a soft spot for the environment,” says Sanders-Reed. “I was the kid who wouldn’t let other kids step on an anthill.” Now she lives in the mountains and loves to ski, but she fears, not only for the landscape, but also for the New Mexico’s cultural heritage— such as Native American communities and old haciendas— threatened by drought and fire. Not surprisingly, Mac’s strong Environmental Studies Department was a big draw for Sanders-Reed, as was its urban location (“great for grassroots organizing”) with easy access to the outdoors. By the end of her first semester, she was already working with MPIRG, 350.org (founded by McKibben), and the Sustainability Office. 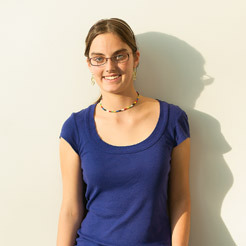 She hopes to soon take up public speaking with student groups, as she did in New Mexico.